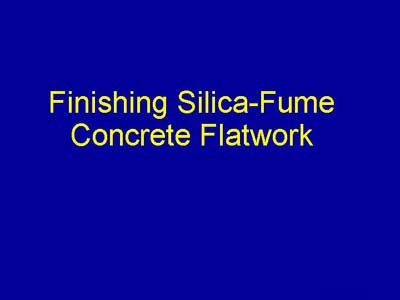 This section of the presentation describes finishing concrete flatwork containing silica fume. Finishing is the one area where working with silica-fume concrete differs most from conventional concrete. Because of the increased tendency for this concrete for plastic shrinkage cracking (discussed later), it is important to complete the finishing process as quickly as possible. The "one-pass" finishing process was developed for use with silica-fume concrete and is described.